The Village of Buffalo Grove invites you to this important event! 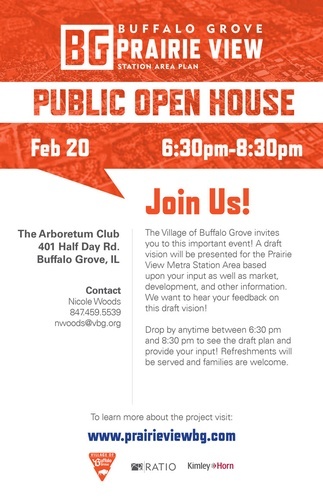 A draft vision will be presented for the Prairie View Metra Station Area based upon your input as well as market, development, and other information. We want to hear your feedback on this draft vision! Refreshments will be served. Families are welcome. For specific questions and comments – please contact Nicole Woods at (847)-459-5539 or nwoods@vbg.org.